Mind the Minions: Paying It Forward - Gift Two of Five. Remember the day out at the cricket... where I sat and crocheted a giant granny square under the scoreboard? 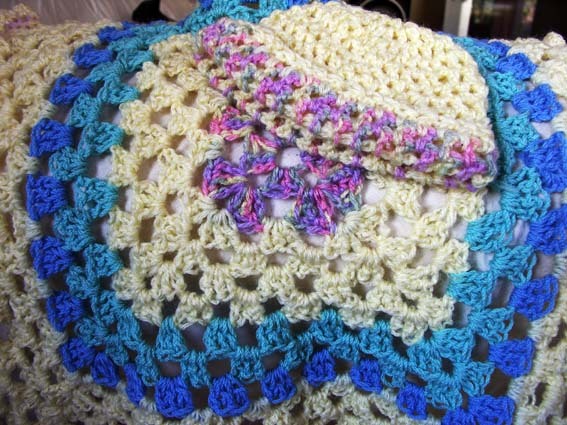 That particular granny square became a carseat blanket for Miss Piggy to match the beanie I made for her. I've now made another set for one of my 'Pay It Forward 2011' recipients - which she will receive at her baby shower. Two down - three to go! Ah... thanks Sal! I truly feel the same way about our friendship. Finally finished Miss Piggy's room today and I'll post some pics on the blog - you'll probably recognise one or two of the items in it ;) Items that I actually brought over in one of the 5 suitcases containing our lives when we emigrated... and that I've hung onto. Love this block! And so kind to give it away! You have a beautiful sense of style and soul, thanks for posting on my blog yesterday! So neat to connect with women across the globe. My dad is from the Netherlands, I wonder if you speak Afrikaans? God bless! My husband was raised afrikaans and I can speak it too. And my maiden surname is Oelofsen, which is Norwegian, I believe. Very glad to have found your blog!